Garmisch Elementary and Middle School’s second annual Pumpkin Drop was held Oct. 27 in front of the school. Students, teachers and parents gathered to watch teams participate in the festive after-school engineering experiment. GARMISCH — Garmisch Elementary and Middle School’s second annual Pumpkin Drop was held Oct. 27 in front of the school. Students, teachers and parents gathered to watch teams participate in the festive after-school engineering experiment. Garmisch Elementary and Middle School, or GEMS, students joined together in groups, one consisting of first through fifth graders and the other of seventh and eighth graders. 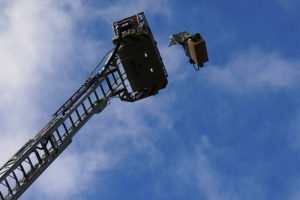 The goal was to develop different methods of dropping a pumpkin from a fire department crane so that it landed undamaged. Garmisch Deputy Garrison Manager Michael Haney and Safety Manager Andi Tuerk raised the crane basket, suspending the six different packages of wrapped pumpkins to a height of nearly 100 feet. One team’s pumpkin survived the challenge. After a quick walk through the woods, the Young Engineers Club, an after-school group for first through fifth grade students, discovered that branches could be used to break the pumpkin’s fall. Their design also featured balloons. The groups were only given one hour to research, plan and design their methods. They used lessons learned from the previous year to inform their design. They also walked through nearby forested areas to brainstorm. Other box designs used a cushioning approach with bubble wrap, pillows and packing peanuts. Unfortunately, none of these methods prevented the pumpkin from bursting into pieces upon impact with the ground. The host nation fire department and GEMS teachers were all present to support the event. The school principal David Groat opened the landed boxes and presented the pumpkins — or pieces of pumpkin — to the cheering crowd.